A’PIEU Real Big Yogurt One-Bottle Apple sheet mask uses essence formulated with Yogurt Extract, Lactobacillus Ferment Filtrate and Apple Extract to enhance skin elasticity and improve skin texture. This sheet mask delivers nutrients sourced from Yogurt Extract that work to boost your skin health, promote skin cell rejuvenation and hydrate your skin. 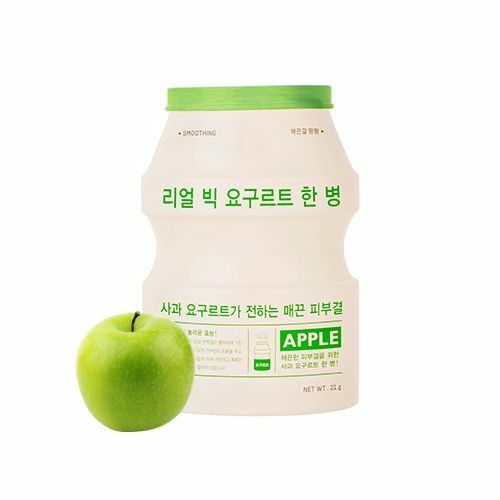 Lactobacillus Ferment Filtrate delivers probiotics which keep your skin balanced and strong while Apple Extract contains natural AHA that gently exfoliates dead skin cells and keeps your skin smooth. Apieu Real Big Yogurt One Bottle Apple is a great hydrating sheet mask that restores your skin and helps you maintain a youthful glow. Apple Extract – rich in Vitamin C, antioxidants and contains natural AHA. This ingredient is a natural exfoliant and also adds hydration to your skin. Yogurt Extract – rich in nutrients including Vitamin B2, protein, minerals and probiotics. It is anti-bacterial and will also boost your skin’s immunity against external factors. Probiotics stimulate skin cell renewal, deliver hydration as well as softens and smooths your skin. Lactobacillus Ferment Filtrate – probiotics that balances your skin by restoring its pH balance, providing hydration and strengthening the skin barrier. More A’PIEU sheet masks here. After cleansing and toning, remove the mask from its packaging and carefully unfold. Adjust the mask to fit and press down gently so it sits evenly on your face. Remove the mask after 15-20 minutes and pat the remaining essence into your skin. Use the remaining essence in the pack for your neck and arms. Don’t waste it! LFI Tip: Open from the bottom of the package. A’pieu is a trendy, affordable skin care brand created by Missha. A’pieu skin care products are formulated for sensitive skin types. Their range focuses on revitalising energy into the skin as well as restoring a youthful glow.